Very large gull. Distinctive adult identified in summer by large black hood, large orange-yellow bill with black band near tip and white primaries with black band near wing-tip. In winter, has large dusky patch behind eye; white eye-crescents present in all ages. 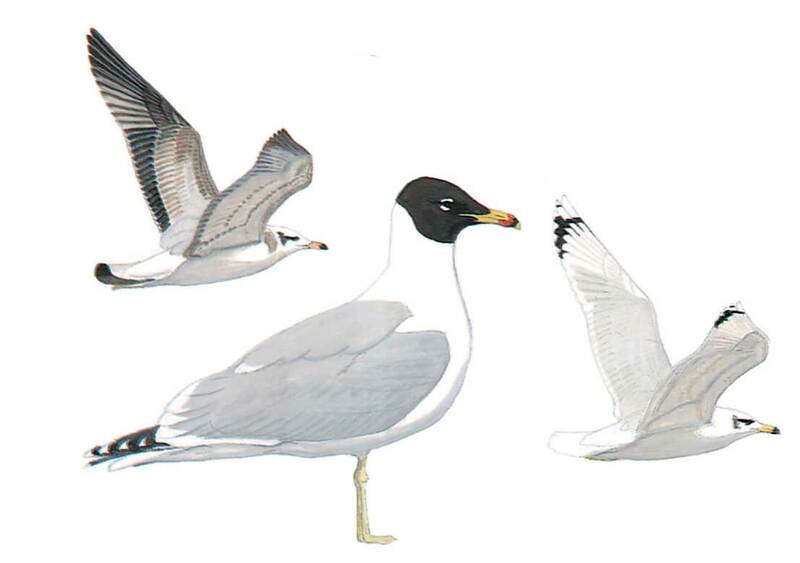 Juvenile and 1st winter told from other young large gulls by unmarked white rump and tail with clear-cut band at tip, unmarked white underparts (though juvenile has grey-mottled breast band or patches at sides, lost in 1st winter), white underwing with extensive black wing-tips and often black-tipped coverts forming underwing-lines, pale mid-wing panel above and head pattern. When standing appears deep-chested and sloping forehead accentuates length of bill.